Art Profolio Digital Disc Storage Sheets are the only protective sheets of their kind. The sheets are constructed of archival-safe polypropylene and are perfect for storing your discs.Designed for standard three-ring binders, the letter-sized sheets securely hold three discs on one side and have a full-sheet pocket on the back for papers.A built-in protective flap ensures the discs are secure, even when the sheets are turned upside down. Textured backing helps prevent scratching.Each pack contains four sheets. Full letter-sized document pocket on backside. Protective flap securely holds discs, even upside down. Textured backing helps prevent scratching. 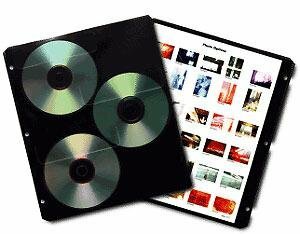 Made of archival-safe polypropylene, 4 sleeves per pack to hold 12 discs. Prat Paris Archival Polypropylene Sheet Protectors with Multi-Hole Perforations, 18" x 24", Fits For Start 1,2,3,4,SE,Premium, Pack of 5. Archivalware Polypropylene Photo Album Pages, 4 mil, Holds 2 Prints 8" X 11", Pack of 25.